Kate's a little iffy about the duck. 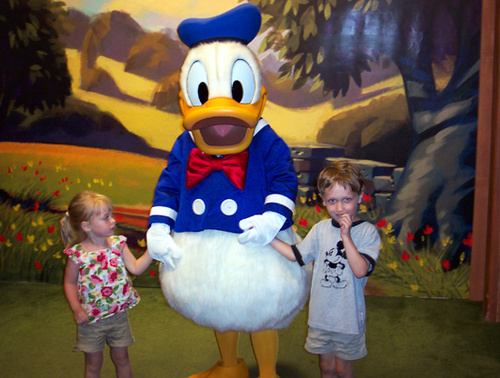 We stood in line for close to an hour for the photo ops with Donald, Pluto and Goofy. If the kids were bummed that they didn't get to see Mickey or Minnie, they didn't show it. Actually, they were most interested in seeing Pete, who, if you're not familiar with your Disney cast of characters, is pretty much the number one Disney villain. We didn't have the heart to tell them that in all likelihood there wouldn't be a costumed Pete walking around the park.